We Have Position Openings for the 2019 Season! If your interest is in customer service, culinary operations, farm/field coordination, or delivery operations …We Want To Hear From YOU! Drop off your application in person or upload it to the interest form! Looking to… meet new people, share exciting information about LOCAL farm fresh products and flowers, work outdoors and have a flexible schedule? Emily’s Produce is seeking honest, dedicated, motivated, friendly and hard working applicants for part-time and full-time seasonal employment. Applicants must be available to work weekdays and must be available for some weekends and have a valid driver’s license. All qualities that describe an Emily’s Team member!! Are you looking for a great opportunity to work while your kids are at school? Are you looking for part-time employment to help off set school costs? Are you looking to supplement your income or simply enjoy some extra spending money? 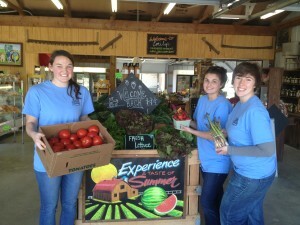 Emily’s Produce is looking for you!